Identify the Mystery Foto's location and the orientation of the photographer. The area is east of Clinton Road in Garden City. The photographer is looking west towards Clinton Road. The Garden City Lodge and the Long Island Motor Parkway's General Manager's Office. Which library was the original source of the photo? The Garden City Archives located in the Garden City Public Library. 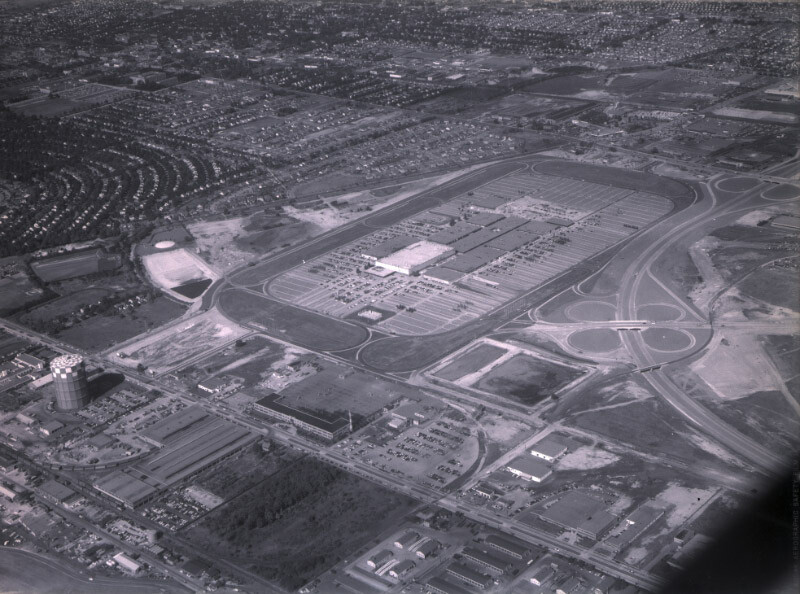 Which online digital collection is the source for this photo and over 50 images of the Motor Parkway and Vanderbilt Cup Races? The image can be found in the New York Heritage Digital Collection. 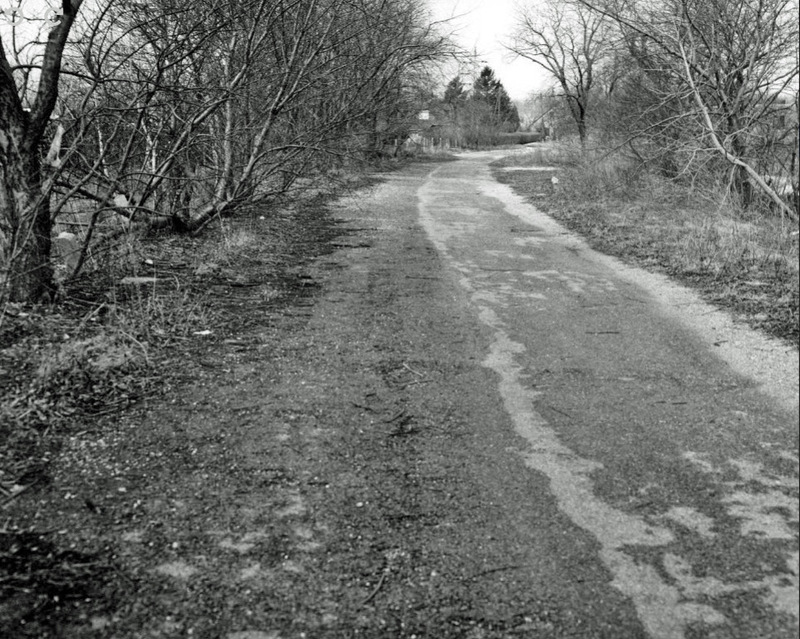 35 other images of the Long Island Motor Parkway can also be found in the collection. 23 images of the Vanderbilt Cup Races can be found in the collection. Congrats to Joe Oesterle, Art Kleiner (see Kleiner's Korner), Frank Mendyk, George Philippides, Steve Lucas, and Greg O. for identifying the Garden City location. Kudos to Frank Mendyk and Art Kleiner for knowing the source for the Mystery Foto. The Garden City Lodge is the building on the left. In the background is the Motor Parkway's general manager's office. 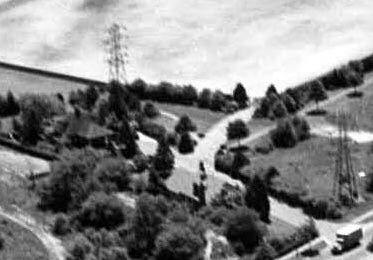 Brian McCarthy: This image can be presented after the mystery is solved The LILCO Gas Holder is a dead give away. The photographer just turned around and snapped this image looking east. This is close to the spot where the photographer took the Mystery Foto in 1950. 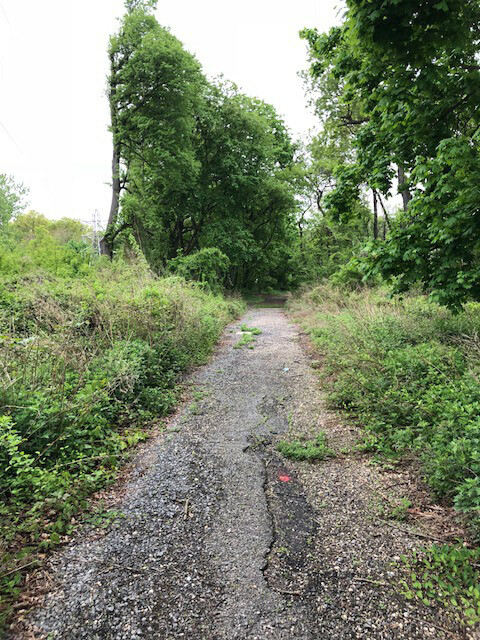 Remnants of the Motor Parkway are still there. 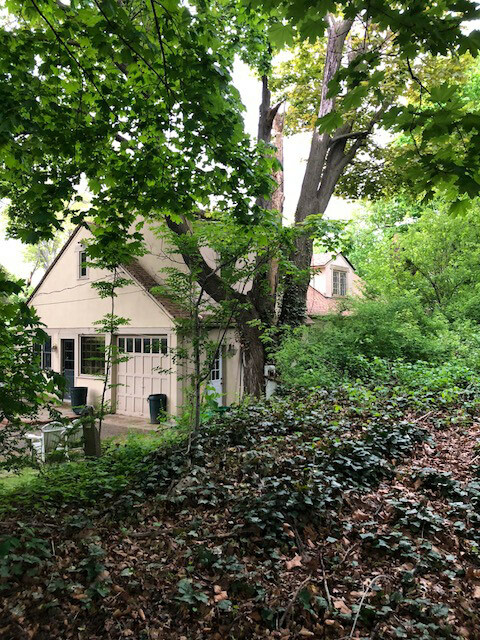 A house can be seen in the location of the Garden City Lodge which was moved to Seventh Street in Garden City in 1989. The location of the Garden City Lodge. The General Manager's Office is now a private residence. Note the roof frame matches the Mystery Foto. The current view looking west. The gas tank is long gone. 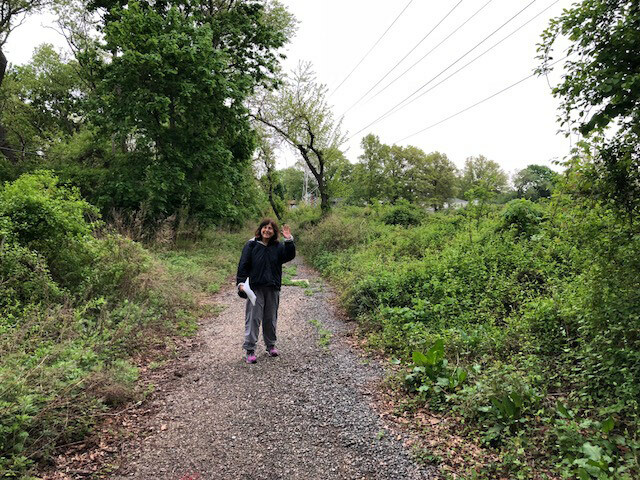 The utility pole indicates you are near the Motor Parkway right-of-way. 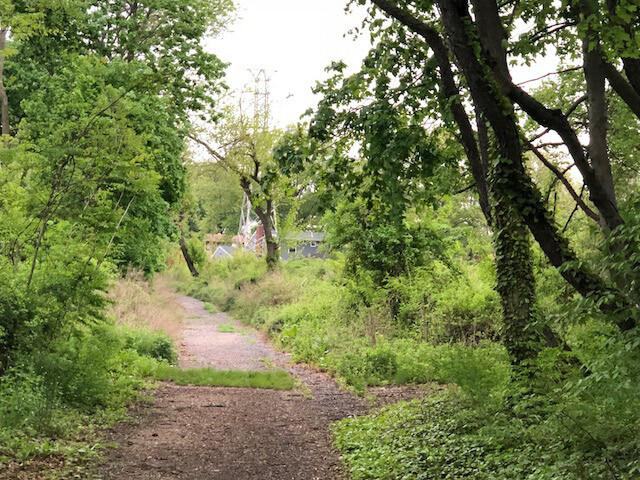 The 3-foot concrete extensions of the Motor Parkway. Motor Parkway pavement. This area was recently cleaned by the Village of Garden City. Bravo! The star marks the likely location of the Mystery Foto photographer. The Garden City Lodge and the General Manager's Office. Garden City. Looking Toward Clinton Rd. Garden City Lodge, then further back the manager’s house/office. Identify the Mystery Foto’s location and the orientation of the photographer. 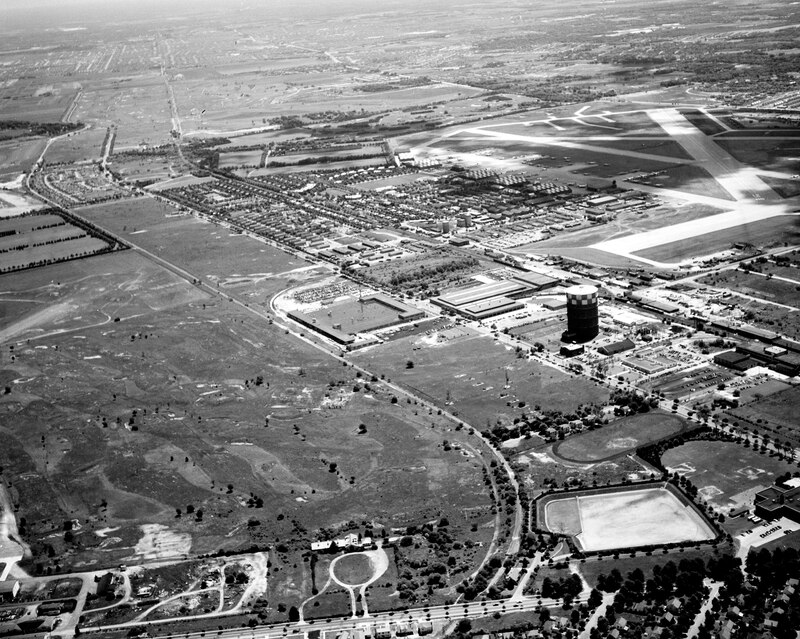 : Garden City, parallel to Stewart Avenue. View is looking northwest towards Clinton Road. 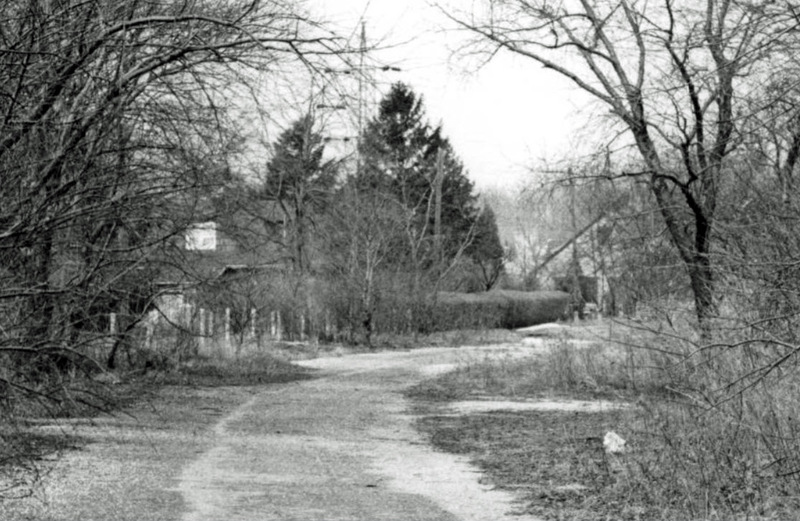 Identify the Motor Parkway structures in the photo: Lodge and General Manager’s Office. Bridge over Clinton Road appears to be obscured. Which online digital collection is the source for this photo and over 50 images of the Motor Parkway and Vanderbilt Cup Races? New York Heritage Digital Collection. Fantastic resource!!! The location of the photo is in east Garden City just east of Clinton Rd. 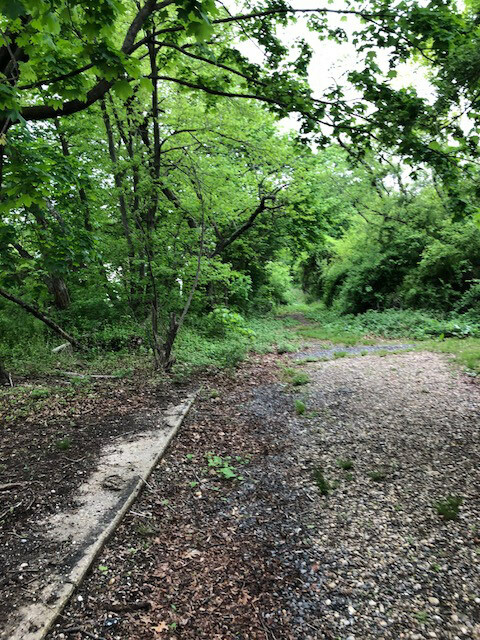 The photo is facing towards the northeast along the LIMP and the Garden City Toll Lodge. 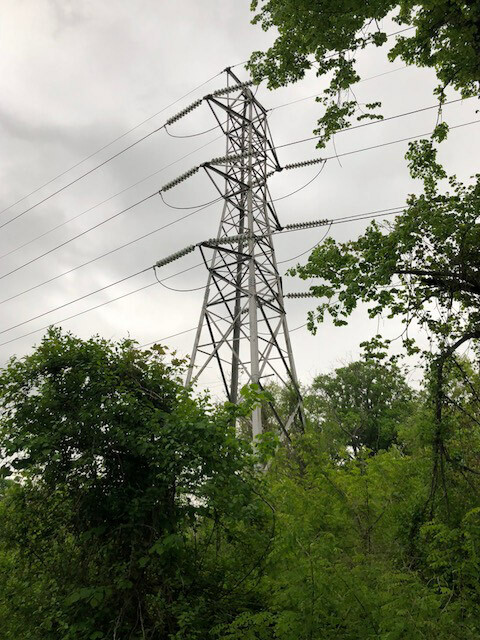 You can also see the electric tower above the ROW which can help you in identifying the location. 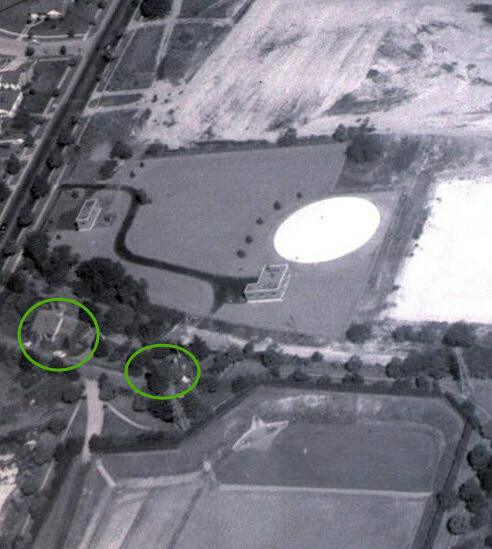 The LIMP structures in the photo are the Garden City Toll Lodge and Office. The Clinton Rd bridge remnants can not be seen. The source of the photo is from the Garden City Public Library digital photo collection. The photo collection is part of the New York Heritage Digital Collection - Garden City Library- nyheritage.org. 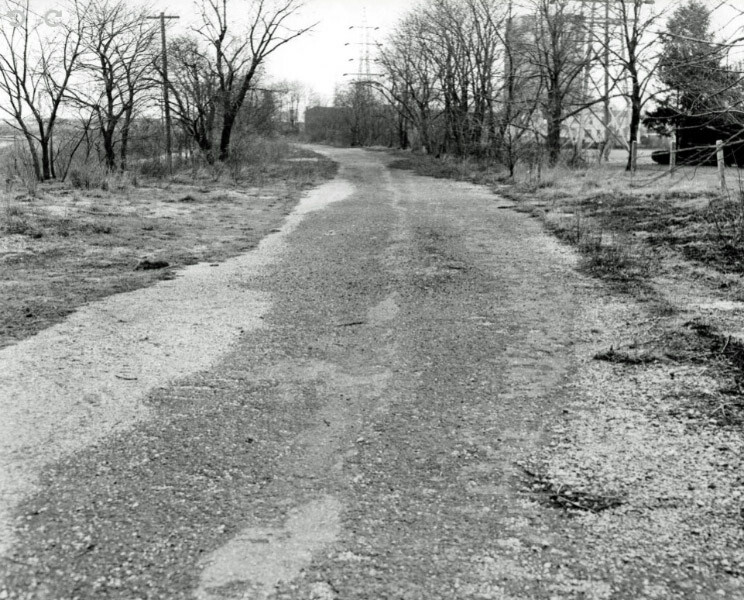 I believe this photo is taken on the Motor Parkway in Garden City, behind the baseball fields at Stewart School. This is the stretch of the parkway between Clinton Rd to the west and Raymond Court/Roosevelt field to the east. This picture faces west and the two visible structures are the Garden City toll house/ Lodge and the Parkway Manager’s office. Just a guess but we may be looking west on the LIMP a few hundred feet east of Clinton Road bridge in the vicinity of the Garden City lodge and General Manager’s office. Original source may have been the Garden City Public Library and can now be found in the NYS Archives Digital Collection. Looks like this is looking West at the Garden City Lodge and Manager’s House on the left. Beyond the curve was where the Clinton Rd bridge stood, but was taken down by the time of this photo. I’ll leave the the library and source answers to people who had more time than me this weekend! 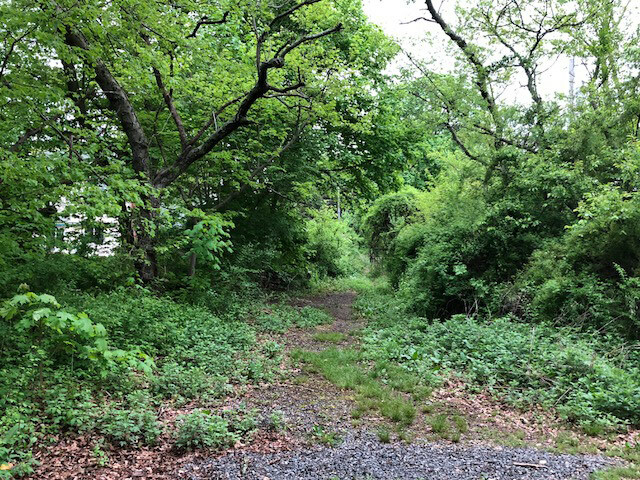 Looks like Deadman’s Curve ( #1 ) in Bethpage looking south near the sharp turn to the west. Tricky one. 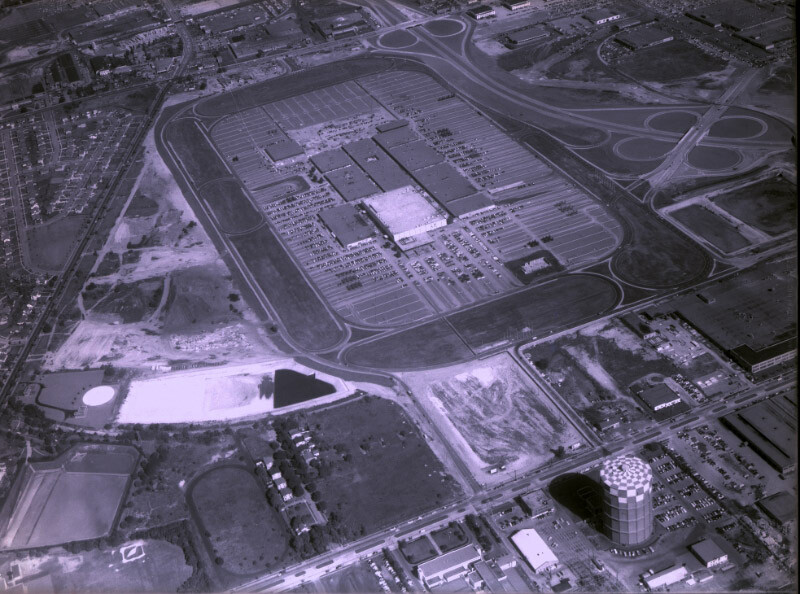 Three possibilities; Great Neck looking east, Garden City looking west, and Bethpage looking east. 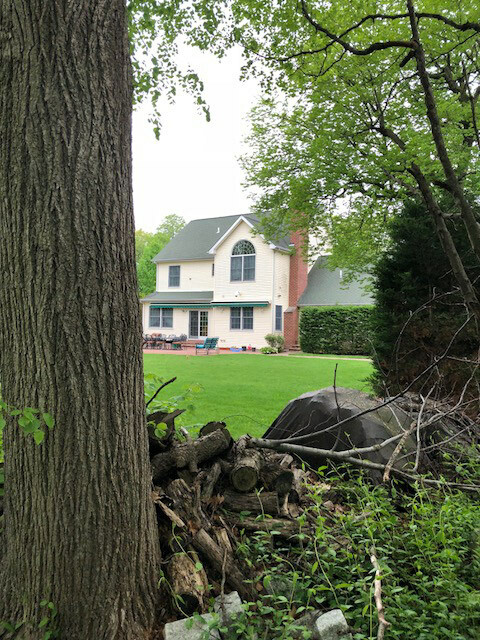 The scenery looks like the Great Neck Lodge where W.C. Field’s car chase ended in “Sally of the Sawdust,” but those cement posts are more lined up for the Bethpage’s Lodge entrance. I say Great Neck looking east. The hedges at center is where the wooden board fence was set up for Field’s to drive through. Hmmm, but I don’t recall power lines by Great Neck but Bethpage does have ‘em. I’ll go with Great Neck for this one. Looking forward to the answer and database location. Nice find Brian. Thomas, you might be exactly the person we have been searching for. 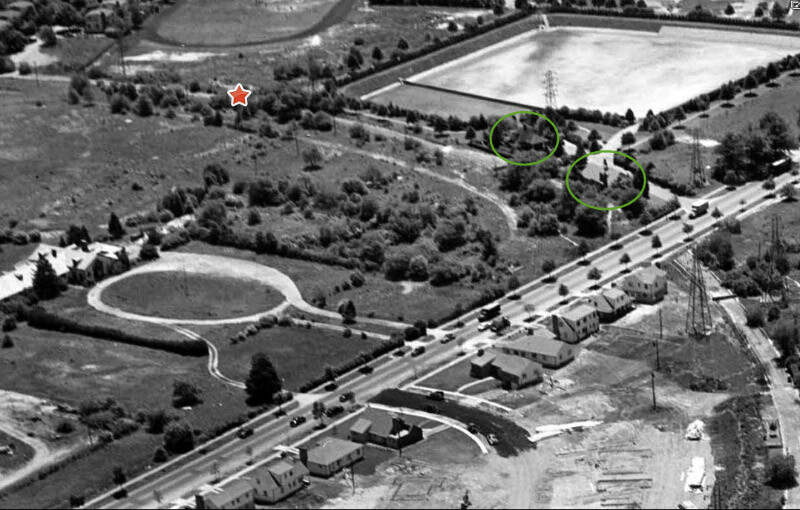 You grew up in Bethpage and rode your bike along the LIMP is the 50s. Can you tell us, do you have memories or even better possibly any photos of the LIMP aim relation to the construction of the Seaford Oyster Bay—135?? Any information / memories you have would be appreciated. Some of us believe the LIMP ran just west of 135, others believe it rode directly on or even slightly east at some points. What are your memories?? Awesome pic btw Brian. It’s amazing that you can still go to this exact location. I love the old original road spots. Nothing beats it. New bike paths? No thanks. I like original historical remnants. Clean that up for preservation purposes, but don’t pour any new road on top of the original! That’s my opinion. Thank you Howard for presenting this image and providing before and after scenes. Knew that most would recognize this area, but it wasn’t so much about having all scratching your heads. I was quite surprised to come across such clear/close up images of the LIMP. Yes Art, the Heritage website is excellent! Have to visit this area soon being that a clearing up has been done recently. I agree, Dave. If the old pavement is still solid, leave it alone! Thank you for sharing your experience on the parkway. This is wonderful to hear! As you approached the toll house (Bethpage Lodge? ), was it located on the left side of the road? Is this where you exited off the parkway? There should have been another bridge immediately after the toll house. Was it closed? Thanks Tom. Tom—-I guess I assumed it was a bike because you said you were 16 years old so either the driving age was younger back then or you were breaking the law! And 80 mph on dead mans curve?? You can see why auto insurance is much higher for youngsters. What I specifically want to know is: after you crossed over Central Ave, heading north, tell us as much as you can about specifically where the LIMP is in relation to 135. 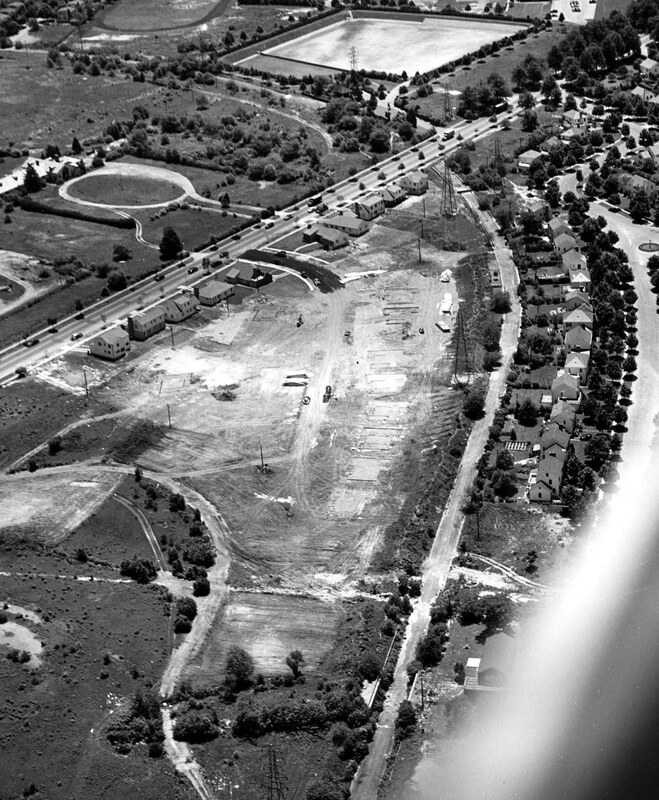 Construction of 135 seems to have started in 1959 and continued through the 60’s so maybe you had moved from Bethpage by that time? But I am very curious to know EXACTLY where the LIMP specifically ran from Central Ave heading north in relation to 135 until it makes the easterly turn into Bethpage Park.